GALION — Galion’s Steve Baldinger, son of Gail and Sharon Baldinger, graduated from Galion High School in June of 1993. Soon after graduating, he signed with the United States Air Force and chose to make his career in serving our country. On May 3rd, Chief Master Sargeant Baldinger will retire from service after nearly 27 years. As a part of his retirement ceremony, the United States Air Force will present Baldinger with an unexpected but fitting “keepsake” — A United States flag. But this flag will hold a special meaning for Baldinger and his family. Baldinger and her husband were moved to tears. The Air Force then contacted Matt Echelberry with the City of Galion to make arrangements for the shipment and flying of the flag. On Tuesday March 26, the soon to be veteran’s flag was flown on the city flag pole outside the city building on Harding Way East. When the flag was taken down from the city pole on Tuesday, members of the Baldinger family were there to watch and help. 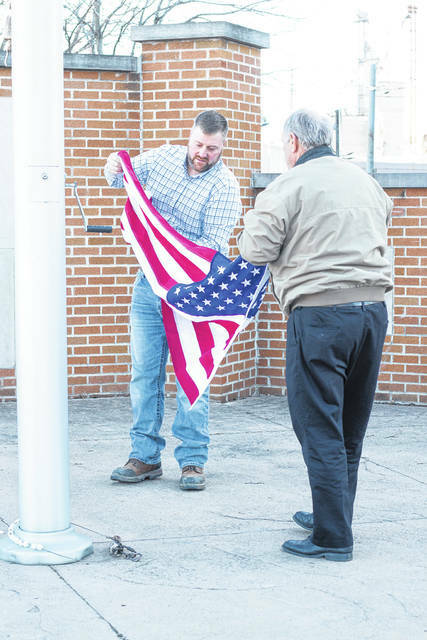 Steve’s father, city council member Gail Baldinger, and his younger brother Eric, City of Galion Building Inspector, handled the removal of the flag as it was lowered. The flag will be returned to the Air Force for keeping until the retirement ceremony to be held at Wright Patterson Air Force Base in Dayton. Baldinger has served all over the United States in his years of service, with his focus in meteorology services. He has also served in military operations in the Middle East and the Balkans. In his current position, he is responsible for managing and evaluating mobility, training, and manning levels across twelve Air Force Military Command sites. Galion City council member Gail Baldinger and his son Eric fold a flag that was flown over Galion on Tuesday to honor son Steve Baldinger who will retire in May after 27 years of service in the United States Air Force. https://www.galioninquirer.com/wp-content/uploads/sites/38/2019/04/web1_IMG_7153.jpgGalion City council member Gail Baldinger and his son Eric fold a flag that was flown over Galion on Tuesday to honor son Steve Baldinger who will retire in May after 27 years of service in the United States Air Force.